Lucy and Mr. Mooney argue about her efficiency. 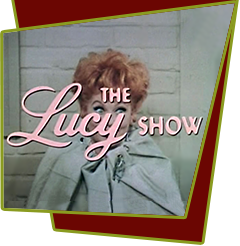 Tired of hearing what a lousy employee she is, leads Lucy to seek another job where she will be more appreciated and prove to Mr. Mooney she could easily get another job. She tries an employment agency and they trick her into taking a high-paying babysitting gig. They don't bother to tell her she'll be taking care of three chimps whose "parents" treat them like little humans and she ends up inadvertently babysitting a family of chimps. Special Notes: The firm Lucy visits is the Unique Employment Agency, whose motto is "Unusual Jobs for Unusual People." This concept will be used later in the creation of the Here's Lucy series. This is Elvia Allman's final appearance on one of Lucy's shows. She first appeared on I Love Lucy in 1952, in episode #36, "Job Switching" as the supervisor who yelled, "Let er' Roll." Bloopers: Although not a part of the filming, an elephant used on the set goes wild and pushes Mary Wickes into one of the prop trees. The trainer has to hit the elephant with a club to get it away from Mary, who injures her arm in the melee. Lucille quickly scoops up the baby chimps in her arms for protection.